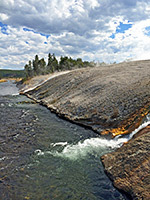 The Midway group has the fewest thermal features of the three main geyser basins in the southwest of Yellowstone National Park though is just as varied, and several of the springs are large and dramatic. 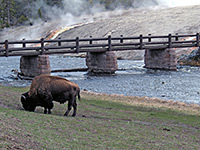 The geysers and pools are mostly concentrated around the Firehole River close to the highway, 11 miles south of Madison Junction. One of the highlights of the whole national park is Grand Prismatic Spring. This is a huge oval pool 370 feet across and 120 feet deep that is surrounded by unusually colorful bands of algae and travertine terraces, with wavy run off channels, giving the appearance, from above, of a giant blue star (see aerial photograph below). The pool constantly bubbles and steams, forming clouds of hot mist that blow around in the breeze and sometimes make the pool itself hard to see properly, but adding to the enchantment of the scene. 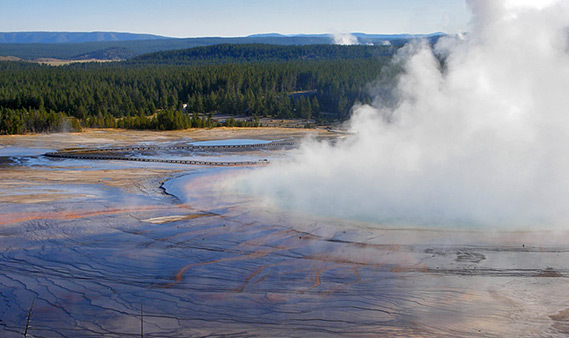 A half mile boardwalk trail runs part way around the spring, past two much smaller pools (Opal and Turquoise) and to the adjacent crater of Excelsior Geyser, formerly the largest geyser on Earth. This is now another big, steaming, simmering pool, the remnant of an explosive eruption in the nineteenth century which destroyed the geyser. The deep blue pool produces up to 4,000 gallons of water a minute, which flows down several colorful drainage channels into the Firehole River. The other pools in this part of the basin are a little further south, where the river enters a short valley, though they have only limited visibility from the road. More are found on the east side of the highway, along the valley of Rabbit Creek but no trail leads here, and most features are unnamed. 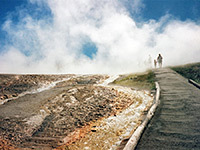 A footpath does enter the western half of the basin, starting by crossing the river then heading north along the side of the valley, past Grand Prismatic Spring and forking soon after; straight on (north) is across meadows and open land to Fountain Flats in the Lower Geyser Basin while left is to other, more isolated geysers of the Midway Basin. 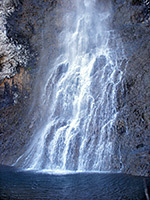 This branch is also fairly level, crossing a sparsely wooded plain for another 1.5 miles towards a marshy area around Fairy Creek where it branches again; the left fork ends after half a mile at the foot of sheer cliffs and the 200 foot Fairy Falls, where the creek cascades prettily down the rock face into a cold, shallow pool. The main trail soon reaches Spray Geyser, notable because its eruptions generally last longer than the quiet periods in between. It throws up water and steam at a 70° angle to heights of 25 feet over several minutes, rests for just a minute or two then begins again. Next is Imperial Geyser - currently just a large, blue boiling pool in a clearing in the woods, this has in past times erupted violently up to 100 feet.